This is my very first Morning Dew kusudama! The diagram is in a book by YAMAGUCHI Makoto/ 山口真 named Kusudama Ball Origami. I believe this is a traditional diagram. This one is actually quite bad looking. I mean the paper is nice and all but I assembled hurriedly and it shows. The photo doesn’t help at all, too. I mean all three photos of this kusudama are somehow blurred! I would take another photo but the kusudama isn’t with me any more so this will do to show you this model… And to tell that things don’t always turns pretty/ ok! This entry was posted on 2007|11|16 at 17:29 and is filed under kusudama (glued), modular origami, origami. You can follow any responses to this entry through the RSS 2.0 feed. You can leave a response, or trackback from your own site. Could you teach me how to make it? What kind of paper do you use? where can i get them? 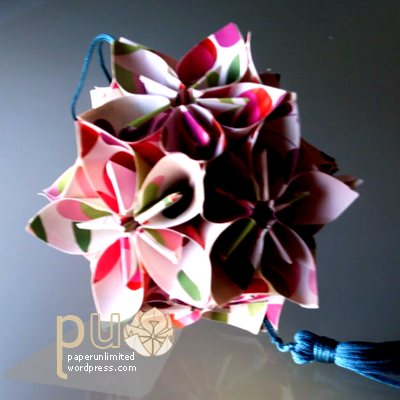 This kusudama was made with wrapping paper. You can check where you buy wrapping paper and see their selection. Or at online stores! It’s an easily available paper and it’s almost everywhere!